Fargo, ND – Small business owners, and by small business I mean panhandlers, will have to take their business elsewhere. Panhandlers have been filing business license applications in records numbers lately in the hopes to become their own small business. The panhandling profession has become very profitable in the Fargo area and citizens are growing concerned. On Monday, city commissioners voted unanimously to expand a city ordinance that bans panhandling in Fargo. Recently there have been a growing number of complaints and concerns of these small business owners lurking on street corners and medians all around Fargo asking and begging for money. I went and spoke with one small business owner who was lurking on 13th ave and 45th ST. and asked him what he thought of the new ordinance. “I need grocery money man. I also need video games, leopard print underwear, and cognac. It’s hard being a business owner and I’m out here just trying to keep the business afloat. This new ordinance could put hardworking people out of business!” he said. 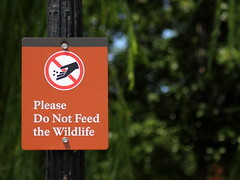 Meanwhile, you will be seeing signs such as the one below on busy street corners and intersections in an attempt to remind people not to feed the animals….er…….panhandlers.